The night time can really transform the city into something truly spectacular. As soon as the sun starts to set and the light levels drop, the city becomes illuminated, and to photograph this is something really special. This workshop will guide you through the technical and creative challenges of taking photographs at night using a tripod and long exposures. We meet first at a pub where I will give attendees of the workshop a book. This will be a great resource for you to use on the night and to refer back to when you need to brush up on these settings. 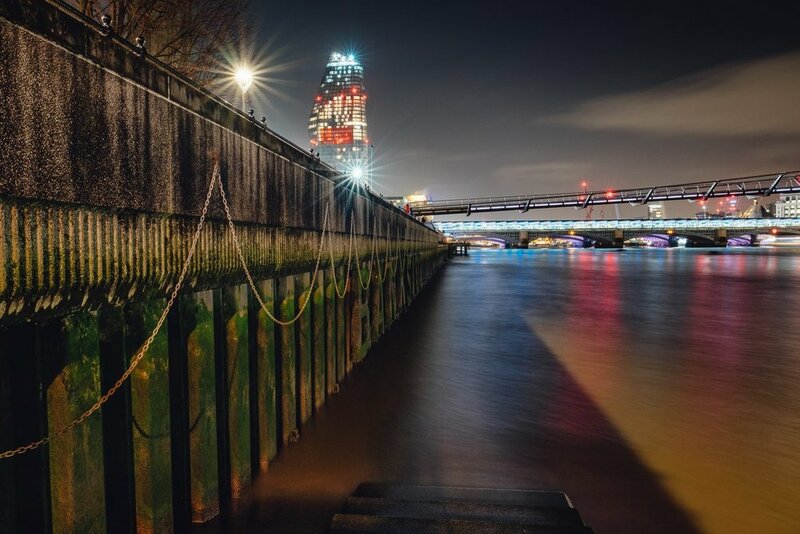 My objectives are for you to take control of your camera by utilising either Aperture Priority or Manual exposure modes so you can start to achieve great photographs at night. You will be photographing using long shutter speeds with your camera on a tripod. 6.00pm - Meeting and talk at a pub near Albert Bridge. At this meeting I will give a talk about settings needed for night photography and hand out some books specially produced for this workshop. You will also have a chance to ask questions. 6.30pm - We head off on a walk along the river to take photographs of the city as it starts to get dark. I will be on hand to ask questions and guide you to take these photos. We will have checkpoints along the way in case we get separated. You will of course have my contact details to call me if you need to. 10.00pm - We aim to finish near Vauxhall Bridge at around 9.30pm. Some knowledge of using modes such as Aperture Priority and Exposure Compensation would be of benefit. Alternatively using Manual Exposure is also fine. Booking can be done safely and securely through the website by purchasing above. Alternatively we can invoice you via email and payment can be made by bank transfer, please contact us if you would prefer this method. The cost listed is per person attending the course. The ability to walk about 2 miles. We will be walking approximately 2 miles for the photowalk but we will be doing this very slowly. The course starts at 6pm when we meet The Prince Albert Pub on the Albert Bridge. The easiest way to get to Albert Bridge is from London Victoria Station.